The risky nature of Big Solar projects has been driven home with California regulators’ move to kill a controversial $1.3 billion transmission line that would have connected massive solar power stations in the desert to coastal cities. “These projects are unlikely to proceed,” wrote Jean Vieth, an administrative law judge with the California Public Utilities Commission, in a ruling rejecting San Diego Gas & Electric’s Sunrise Powerlink transmission line. 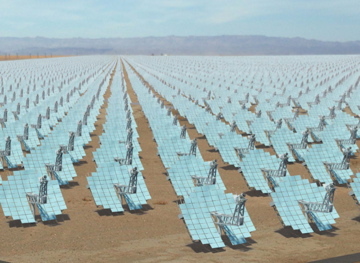 Phoenix-based Stirling Energy Systems in 2005 scored a contract to provide SDG&E (SRE) with up to 900 megawatts of electricity to be generated by as many as 36,000 solar dishes. A few months later, the utility filed an application to build the Sunrise Powerlink, a new transmission line to connect the Stirling power plants and other renewable energy projects to the coast. But the utility’s proposal to build 150-foot-high transmission towers right through wilderness areas of Anza-Borrego State Park, home to a host of protected species, triggered a long-running fight with green groups that generated an 11,000-page environmental impact report. On Halloween, Vieth issued a ruling that found that despite state mandates to cut greenhouse gas emissions, the environmental impact of the transmission project was frightening. “The potentially high economic costs to ratepayers and the potential implications for our [greenhouse gas] policy objectives do not justify the severe environmental damage that any of the transmission proposals would cause,” concluded Vieth in a 265-page decision. The battle isn’t over — the public utilities commission will vote in December whether to accept the judge’s ruling. They will also consider an alternative decision issued by a commissioner assigned to review the case. That decision would let SDG&E build a transmission line along a different route under certain conditions. Public Utilities Commissioner Dian Grueneich’s alternative decision would allow San Diego Gas & Electric to build Sunrise Powerlink along a more environmentally-benign route if the utility could prove that most of the transmission line would carry renewable energy so as to offset the 100,000 tons of greenhouse gases emitted during its construction. “Reliance on a single 900-megawatt contract (the Stirling Energy Systems contract) is too risky,” she wrote. So where does this leave Stirling? COO Bruce Osborn didn’t immediately respond to a request for comment. But earlier this year, he told Green Wombat that even if Sunrise Powerlink was killed, there’s enough existing transmission capacity to carry electricity from the power plant’s first 300-megawatt phase. Stirling also has a 20-year contract to supply up to 850 megawatts of electricity to utility Southern California Edison (EIX), a deal not contingent on Sunrise Powerlink.